At the March 1, 2014, Transhuman Visions 2.0 conference in Piedmont, CA (where Wendy and I gave a presentation on Death is Wrong), I was pleased to meet Neal VanDeRee of The Church of Perpetual Life, an organization promoting the desirability of living without end and inspired by the philosophy of the great Russian Cosmist thinker Nikolai Fedorov (or Fyodorov – a better Anglicization of the Russian “Фёдоров”). Mr. VanDeRee organized a drawing of attendees’ business cards, for which the prize was an ancient Roman coin from the 4th century CE. I was thrilled to win the drawing, and I received my coin in the mail today. Here are images (scans on top, photographs on bottom) of both the front (obverse) and back (reverse) sides of the coin. This particular coin is a commemorative coin for the city of Constantinople, with a left-facing image of a helmeted emperor (likely Constantine I – Roman emperor from 306 to 337) on the obverse side and a winged Victory goddess with a spear and shield on the reverse side. 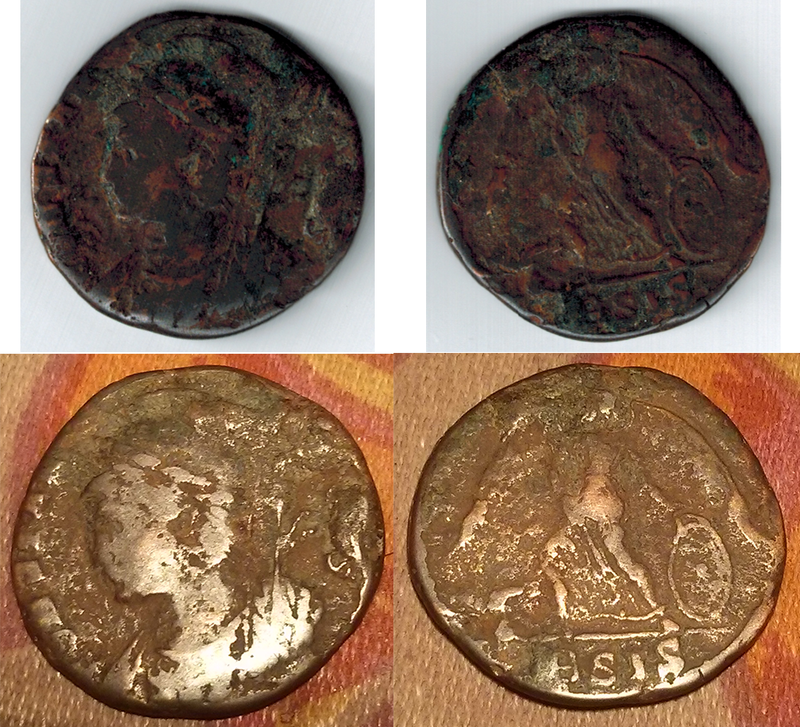 Here and here are images of two highly similar coins, which are identified on the Dirty Old Coins website as dating from 330-333 CE and 334-335 CE, respectively. Another highly similar coin is listed here on the Portable Antiquities Scheme site from the United Kingdom. That coin is dated to 334-335 CE. Based on our research, Wendy and I are reasonably confident that our coin, too, dates to the 330s CE, prior to Constantine’s death. In Death is Wrong, I wrote about an 1893 Indian head penny which I found in the hallways of my high school in 2004, when I was gathering spare change found in the “state of nature” in order to donate to the Methuselah Mouse Prize. I am happy to still have this object – older than any living human being today – in my coin collection. This Roman coin from the 330s, though, is older by an order of magnitude. It has existed for approximately 1680 years already, and it is certainly the oldest object I own. May it continue to exist indefinitely, and may all of us humans continue to live indefinitely also!